The Lean Startup by Eric Ries is based on the philosophy that in the current technologically advanced world, building a new business on a new idea is not a problem. The problem is the successful execution of the idea. The principles in The Lean Startup tells us how today’s entrepreneurs use continuous innovation to create radically successful businesses. So are you ready to learn the lean startup method? The traditional image of a startup in the minds of people is a small company which is working on a project which is either trendy or related to technology. But according to the author, a startup is any business which is working on a product or service which did not exist until today. Since they are new kind of businesses, no prior knowledge of systematic execution, demand forecast, market potential and many other important aspects, create the conditions of extreme uncertainty. Learning is important for startups. Enormous learning is a part of a startup. But according to the author, learning should not be a waste of time. After the failure of startup, the entrepreneur should not give the excuse that even though the startup failed but at least he learned something. The time and money spent on developing a product before it’s launch are not coming back. Learning will not put the money in his pocket. Therefore instead of just learning, he should focus on Validated Learning. While working on his startup, whatever an entrepreneur learns should be validated. He should learn what will provide true value to your customers? What his customers truly want in the product? Which features they won’t mind being absent in the product? After finding what will be truly valuable and what is useless for his customers, he should focus on the aspects which are most valuable. Every startup begins with a leap of faith that the product we are building will be desirable by the customers. It is the riskiest assumption which we are making about our idea. We can validate our idea by validating the two assumptions attached to it- The Value Hypothesis and The Growth Hypothesis. The Value Hypothesis- This is the assumption about the value of our product. Would our product be valuable to our customers once they start using it? Value Hypothesis can be tested by creating a Minimum Viable Product (MVP). Create a product with sufficient features to satisfy early adopters. The feedbacks should guide the future development of the product. See how Dropbox created a minimum viable product in the form of a video. Thousands of people registered for the service after watching the video which proved that the service was actually valuable to the customers. Growth Hypothesis- This is the assumption about the growth of our product. How would new customers discover our product? Growth Hypothesis can be tested after knowing that how likely are early adopters are to recommend our product to others. Facebook and Whatsapp are the examples of validated growth hypothesis. Most of the users started using these services after their friends referred them. The results are in front of us. A/B testing is another method to acquire validated learning. In A/B testing we offer two variants of the same products to our customers. We then observe which variant is working better. In this way, we can know which is the best version of our product, straight from our customers. After knowing the best option, we can then implement it on our product. Many times startups spend months and years developing a product which nobody wants. They believe that what they are creating is something groundbreaking and customers will line up to buy their products. After spending months, when the completely finished product reaches into the hands of customers, they find that it is not at all desired by anybody. This is why validated learning is important. The Build-Measure-Learn feedback loop is used to attain and apply the desired validated learning in the successful launch of the product. Build- Now, after specifying about what are the pieces of information that you are looking for, build a minimum viable product. Just like Dropbox did in the above example. Include the 20% of the features which the 80% of users might like. Focus on early adopters at this stage. start taking feedback from your early adopters. Try to extract the information which you planned to achieve from this experiment. Measure- After getting the information in stage 2, you need to measure the results. You need to measure the deviation from your hypothesis to actual results. Is your idea worth pursuing? Can you convert it into a profitable business? These are the main metrics which you need to measure. Learn- After measuring the results of your experiment, you will come in the ‘Learn’ phase where you have acquired sufficient learnings to make sound decisions. Here you are equipped with the right set of information which will help you decide how to move further with your idea. Now after learning the lessons, start with the loop again and try to get as close as possible to a perfect product. 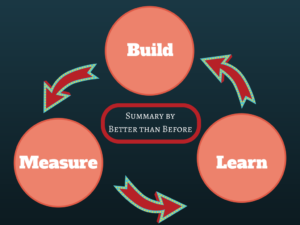 After a cycle of Build Measure Learn Feedback Loop, you can either of the take two decisions- Persevere or Pivot. Persevere- If your test with the feedback loop gives a positive result then you can persevere your idea. But constantly going through the loop even after getting positive results will not only help you in generating a more refined idea, but it will also inform you at the right time if their arises a need to bring a change. Pivot- When your hypothesis proves to be wrong, you will still know about the shortcomings of your idea because of the feedback loop. Readjust your idea and planning phase which you saw after getting valuable insights from the feedback loop. To make your startup successful, try to fasten the process of going through the feedback loop and taking the decisions regarding Pivot and Persevere. So, these were my key takeaways from the Lean Startup. Of course, you will need to read the book to get the whole grasp of all the techniques and method to make your startup work. The author Eric Ries has given many examples of the above ideas and there are many more ideas which you can learn from the book. I recommend you to read the whole book to get all the benefits. Please click on the image below to buy the book from Amazon.